As I’ve mentioned in 2008, 2009, and 2011, our family makes a trip to Pennsylvania every year for Dave’s family reunion in Lancaster County. I didn’t go in 2010 — Dave flew to PA with the boys while I did some reserve work — so I didn’t write about it. To be honest, I haven’t written much detail about the reunions themselves. I guess I just say “We’re going” and that’s about it. It’s mainly hanging out drinking some Yuengling, eating Hammond’s Pretzels, catching up with the others from Dave’s Dad’s side of the family. The folks are all wonderful and it’s especially fun to see how grown up the younger family members become year after year. This year, some of the youngest family members when I first went to a Vollmer reunion in 1994 are about to become seniors in college!!!! Wow! We also pay a visit with several loved ones from Dave’s Mom’s side of the family. Some of them drive in from Philadelphia to Lancaster County to visit with Dave’s parents and our foursome and we’re always flattered and humbled by their efforts. Each year Jacob seems to top himself with how much he can eat: this year it was a foot-long chicken parmesan sub sandwich! The kids have officially outgrown Thomas <sniff sniff> and didn’t mind not riding with him this year. 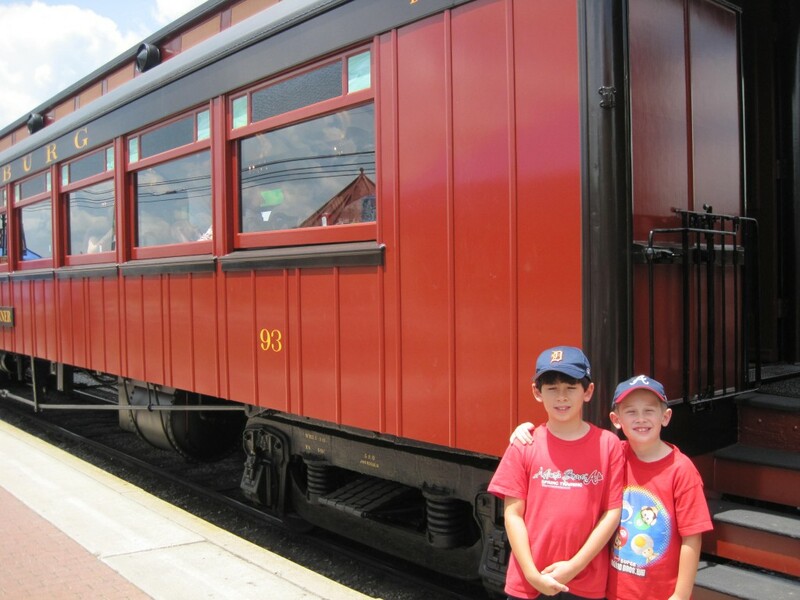 Some of my favorite memories of my little boys will always be with that useful engine…. 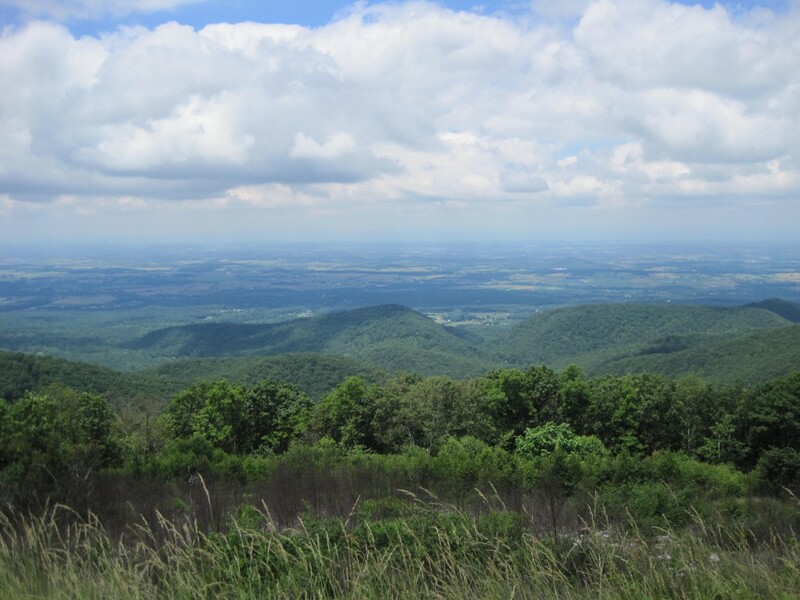 We took a detour on the drive northward and took in some of Skyline Drive in Virginia’s Shenandoah National Park. Check out that stunning view! We only drove the southernmost 40 miles, from mileposts 105 to 65 or so. As soon as we rolled into Lancaster County, we took the boys on their first trip to Good ‘n Plenty, a family-style all-you-can-eat Amish food experience. I had first visited this restaurant on a Girl Scout in about 1986. Dave and I have only been here about every 5 years since we’ve been married. Timmy really…really…REALLY liked the fried chicken legs. 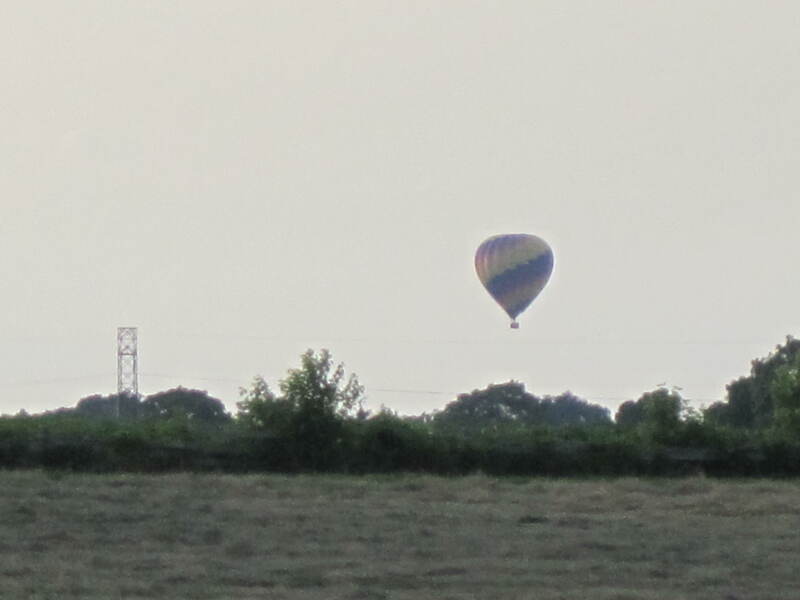 Dave indulged me a little while I attempted to get pictures of a hot air balloon floating over Lancaster County near sunset. My camera has seen better days, so this was the best picture I could muster through an open window of a moving car. 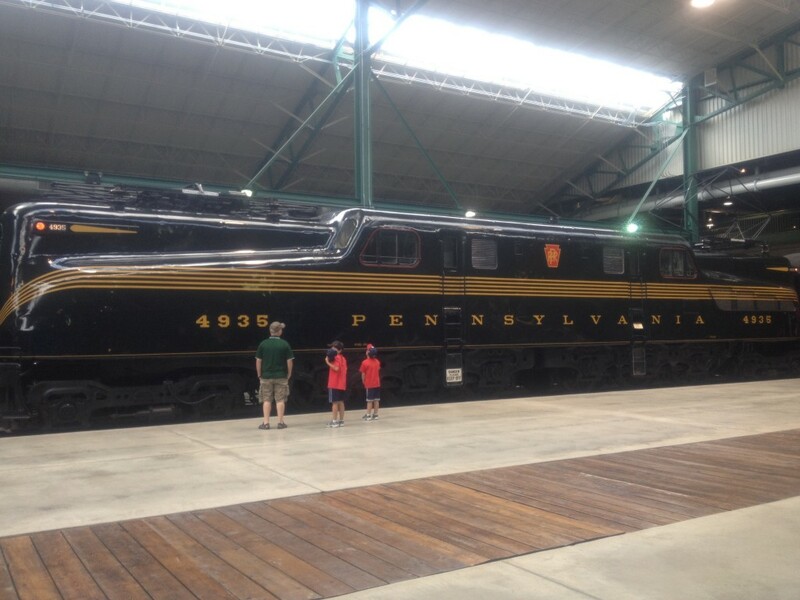 The boys enjoyed a morning at the Railroad Museum of Pennsylvania. It was great visiting on a non-Day-Out-With-Thomas day for the first time in nearly 10 years! We enjoyed a lunch on the Strasburg Railroad’s Dining Car, which had JUST re-opened for business on June 15th after being unavailable due to a restoration. 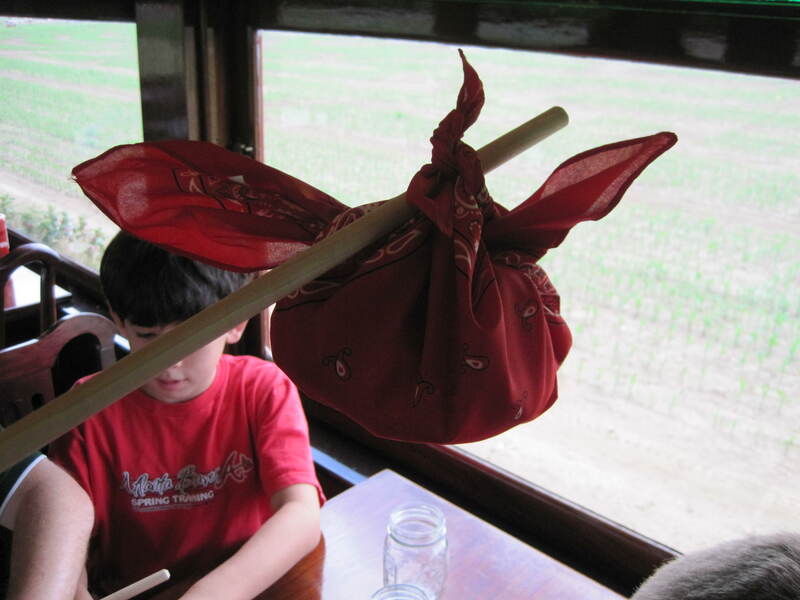 The “Hobo Lunches” came out to us in a hobo-styled knapsack tied to a stick. We were allowed to keep the bandanas. 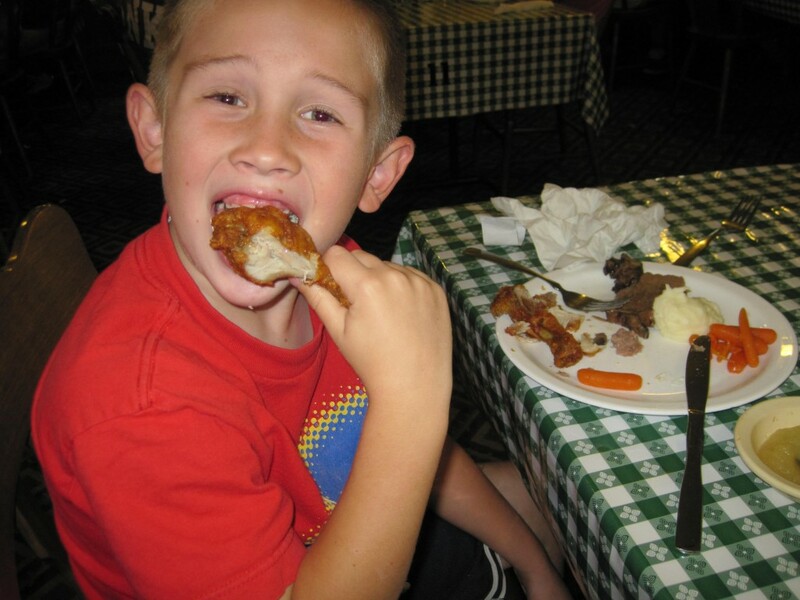 The food was catered by The Hershey Farm restaurant — also in Strasburg, not associated with the chocolate company. Since we were on the 2nd ever trip since the restoration, there were a lot of glitches to the food service and our train left late and we ended up with an abridged ride! Boo!